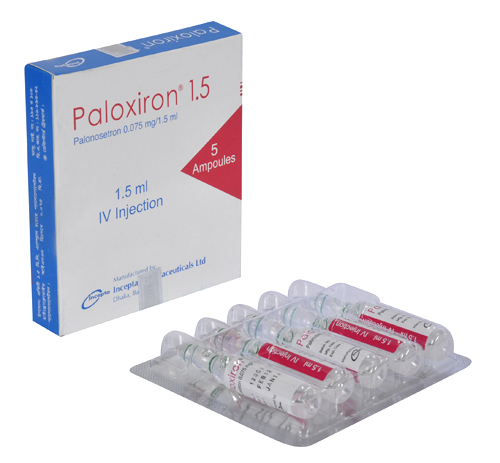 Paloxiron 5 Injection: Each 5 ml ampoule contains 0.25 mg of Palonosetron as Palonosetron hydrochloride INN. 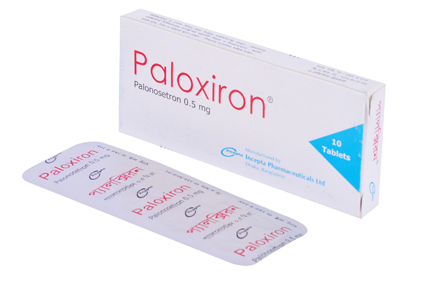 Paloxiron 0.5 mg tablet: Each tablet contains 0.5 mg of Palonosetron as Palonosetron Hydrochloride INN. Absorption: Following IV administration, the C max and AUC are generally dose-proportional. After a single IV dose at 3 mcg/kg, mean C max was approximately 5.6 ng/mL and AUC was 35.8 ng-h/mL. Distribution: Vd is approximately 8.3 L/kg, and protein binding is about 62%. Metabolism: Approximately 50% is metabolized to 2 metabolites that have less than 1% of the activity of Palonosetron. The major isozyme responsible for metabolism appears to be CYP2D6 and, to a lesser degree, CYP1A2 and CYP3A are involved. Elimination: Following IV administration, approximately 80% of the dose is recovered in the urine. The terminal half-life is approximately 40 h.
PHARMACODYNAMICS: The effect of Palonosetron on blood pressure, heart rate, and ECG parameters including QTc were comparable to ondansetron and dolasetron in CINV clinical trials. In PONV clinical trials the effect of Palonosetron on the QTc interval was no different from placebo. Cancer chemotherapy may be associated with a high incidence of nausea and vomiting. 5-HT3 receptors are located on the nerve terminals of the vagus in the periphery and centrally in the chemoreceptor trigger. It is thought that chemotherapeutic agents release serotonin (5-HT) from the enterochromaffin cells of the small intestine. The released serotonin then activates 5-HT3 receptors located on vagal afferents to initiate the vomiting reflex. Postoperative nausea and vomiting is influenced by multiple patient, surgical and anesthesia related factors and is triggered by release of serotonin (5-HT) in a cascade of neuronal events involving both the central nervous system and the gastrointestinal tract. The 5-HT3 receptor has been demonstrated to selectively participate in the emetic response. 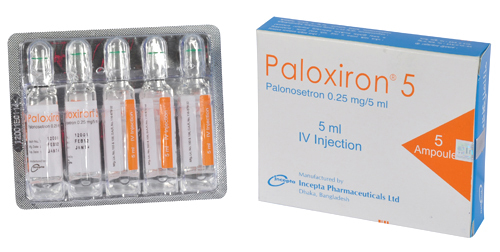 Palonosetron is a 5-HT3 receptor antagonist with a strong binding affinity for this receptor. As a result, serotonin can’t activates 5-HT3 receptors and thus fails to initiate vomiting reflux. Dosage for Adults - a single 0.25 mg I.V. dose administered over 30 seconds. Dosing should occur 30 minutes before the start of chemotherapy. Alternatively 0.5 mg tablet approximately 1 hour before the start of chemotherapy. Dosage for Adults - a single 0.075 mg I.V. dose administered over 10 seconds immediately before the induction of anesthesia. In case of 0.5 mg tablet, dose should be determined by the physician. Safety and effectiveness in patients below the age of 18 years have not been established. However different clinical trial shows Palonosetron is well tolerated and effective from one month of age. No dosage adjustments are needed with any degree of renal function impairment. No dosage adjustments are needed with any degree of hepatic function impairment. No dosage adjustments or special monitoring are needed in elderly patients. • For IV administration only. Not for intradermal, subcutaneous, or IM administration. • Do not administer if particulate matter, cloudiness, or discoloration is noted. • Discard any unused solution. Do not save unused solution for later administration. • Do not mix with other medications. US FDA Pregnancy category B. It is not known whether Paloxiron is excreted in human milk.